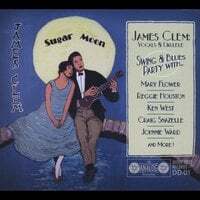 "Sugar Moon" is an acoustic Swing and Blues album that features lots of great guest musicians such as Mary Flower, Reggie Houston and others playing behind James Clem handling the vocals and ukulele with a crack rhythm section. Recorded live in the studio to analog tape this is one all smokin' all the time recording. Runner up for Best Ukulele CD for 2015 from UK's Ukulele Hunt. Mastering session with Ron Rogers and Kevin Nettleingham at Nettleingham Audio in Vancouver, WA. Click on the links above to hear samples from the whole album or buy the music from CD Baby. Sugar Moon is also available on iTunes by clicking here.